Dr. Nandakumar is a Professor of the Practice at Brandeis University where is the Director of the PhD Program at the Heller School of Social Policy and is the Director of the Institute for Global Health and Development. Starting January 1st, Dr. Nandakumar was appointed as the first Chief Economist at the Office of the Global AIDS Coordinator. Prior to that Dr. Nandakumar served for four years as the first Chief Economist for the Global Health Bureau at USAID. In that role he provided intellectual leadership relating to all aspects of health economics within USAID’s Bureau for Global Health, and provides expert strategic and analytical support to USAID’s global health work in priority countries. He was responsible to foster a culture of economic analysis into USAID’s global health programming, to ensure value for money in terms of health impact, and to foster sustainable country-owned health systems. He represented USAID in discussions with other donor agencies in issues relating to health financing and health economics. He was the technical lead on an innovative and new $63.5 million OGAC funded initiative to increase country spending on HIV/AIDS services. He helped set up and provide technical leadership to the Practice Group on Health Financing. A main focus of his work at USAID was building internal capacity in health financing issues. He worked extensively on understanding how the rapid economic transition taking place in low and middle-income countries could be leveraged to increase their spending on health. 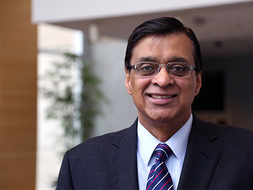 Dr. Nandakumar is an internationally recognized health-financing expert, known specifically for his work in resource tracking, health financing, and healthcare policy and research. A former Indian Administrative Services Officer, his thinking is framed by the importance of governance, driven by the need for greater accountability, arising from limited resources and a growing demand to demonstrate results. After leaving the Indian Administrative Service Dr. Nandakumar was an Assistant Professor at the Harvard School of Public Health, a Principal Associate with Abt Associates and a Senior Health Economist with RTI International. He took a leave of absence from Brandeis to work at the Bill and Melinda Gates foundation as a Senior Program officer where he assisted with the development of the of the Global Health Delivery Area strategy, the India strategy and also represented the Foundation in international working groups. Dr. Nandakumar has also worked as a Director in the Emerging Markets Group at Deloitte Consulting. Akobirshoev, I; Nandakumar, Allyala Krishna. Violence in Childhood: Technical Note on Imputation of Prevalence Rates. Ending Violence in Childhood Global Report, Know Violence in Childhood, New Delhi India: 2017. Oulusoji, A; Eozenou, P; Nandakumar, Allyala Krishna; Pablo-Mendez, A; Evans, T; Ly, C. "The economic transition of health in Africa: a call for progressive pragmatism to shape the future of health financing." Journal of Health Services Research (2017). Shiva Kumar, A.K; Mehta, S.K; Nandakumar, Allyala Krishna. Violence in Childhood (VIC) Index: Methodology and Measurement. Ending Violence in Childhood Global Report 2017. Know Violence in Childhood, New Delhi India: 2017. Zahan, Rofat; Islam, Mohammed; Ramsay, Dana; Steeven, Meagan; Dankwah, Emmanuel; Ikoo, Richa; Nandakumar, Allyala Krishna; Farag, Marwa. "Factors influencing the use of family planning methods in Bangladesh: Multivariate analysis using three rounds of survey data." International Perspectives on Sexual and Reproductive Health (2017). Zeng, W; Halasa, Y A; Cross, M; Akhtar, H; Nandakumar, AK; Shepard, DS. "Costing the essential service package provided by a non-governmental organization in Bangladesh." Health Policy and Planning (2017). Diana Bowser, Jaya Gupta, Nandakumar, Allyala Krishna. "The Impact of innovative health financing on infant and under five maternal mortality." Health Systems and Reform DOI:10.1090/23288604.2016.1166306. (2016). Diana Bowser, Jaya Gupta, and Allyala Nandakumar.. "The impact of innovative health carefinancing on infant, under five and maternal mortality.." Health Systems & Reform (In Press) (2016). Diana Bowser, Wu Zeng, Ilhom Akobirshoev, Tyler Morrill, and Allyala Nandakumar. "The Impact of Health Care Spending and Income Inequality on Stunting Prevalence.." International Journal of Healthcare 2(2): 23-33. (2016). Koblinsky, Marge; Cheryl, A; Calvert, Clara; Campbell, James; Campbell, Oona; Feiger, Andrea B; Graham, Wendy; Hatt, Laurel J; Hodgkins, Steve; Mathews, Zoe; McDougall, LOri; Moran, Allisyn; Nandakumar, Allyala Krishna; Langer, Ana. "Quality maternal care for every woman, everywhere: A call to action." The Lancet (2016). Nandakumar, Allyala Krishna; Ly, Caroline, White, Trenton. "Determinants of National Health Expenditures." International Encyclopedia of Public Health (2016). Eluwa G.; Nandakumar, A.K. ; Farag, M;, Oxford University Press. "Does Public Spending on Health and Investment in Women Matter for Health Outcomes in Nigeria." Health Policy and Planning (2015). Gaumer, G., Zeng, W., Nandakumar, Allyala Krishna. "Modeling the returns on options for improving malaria management in Ethiopia." Health Policy and Planning (2013). Farag. M; Nandakumar, Allyala Krishna; Wallack, S; Hodgkin, D; Gaumer, G; Erbil, C. "Health expenditures, health outcomes and the role of good governance." International Journal of Health Care Financing and Economics (2012). Marwa, F; Nandakumar, Allayala Krishna; Wallack,S; Hodgkin, D; Gaumer,G; Erbil, S. "The income elasticity of health care spending in developing and developed countries." International Journal of Health Care Financing and Economics (2012). Beswick, J., Nandakumar, A.K., Creciun, M., Khoshi, S. A Framework to Understand the Kerala Experience and its Replicability in other Settings. The Bill and Melinda Gates Foundation: 2010. Razavi, M., Nandakumar, A.K., Wallack, S., Gaumer, G., Beswick, J.. Malaria Cases Worldwide: Large Expenditure and Low Returns Necessitate a New Financing Strategy.. Brandeis University: 2010. Farag, M., Nandakumar, A.K., Wallack, S.S., Gaumer, G., Hodgkin, D. "Does Funding From Donors Displace Government Spending For Health in Developing Countries?." Health Affairs 28. 4 (2009): 1045-1055. Nandakumar, A.K., Beswick, J., Thomas, C.P., Wallack, S.S., Kress, D. "Pathways Of Health Technology Diffusion:The United States and Low Income Countries." Health Affairs 28. 4 (2009): 986-995. Yara Halasa and Nandakumar, A.K.. "Factors Determining Choice of Health Care Providers in Jordan." Eastern Mediterranean Health Journal 15. 4 (2009). Nandakumar, Allyala Krishna. "Resource Mobilization for HIV/AIDS Services in Asia." Candidate Policy Options Workshop for Commission on AIDS in Asia, Bangkok, Thailand. 2007. Nandakumar, Allyala Krishna. Cost Estimates ofHIV/AIDS Services in Asia. Proc. of Candidate Policy Options Workshop for Commission on AIDS in Asia. Bangkok, Thailand: 2007. Nandakumar, A.K.. Costing of Health Interventions: Findings and Uses. Ministry of Health, Rwanda: 2006. Nandakumar, A.K., Tsolmongerel, Ts. , Bulganchimeg, B.. Hospital Costing Study in Mongolia. Asian Development Bank and Mongolian Ministry of Health. Ulaanbaatar: 2005. Nandakumar, A.K.. Tracking Resources for Global Health: Ideas for moving forward from the Global Health Resource Tracking Group. Global National Health Accounts Symposium, Barcelona, Spain: 2005. Nandakumar, A.K.. Conceptualization and Preliminary Recommendations for Developing or Strengthening NHA, and Systems at National and Sub-National Levels. Schneider Institute for Health Policy, Heller School, Brandeis University, for the Center for Global Development. Waltham, MA: 2005. Nandakumar, A.K.. Costing of the Mongolian Essential Health Package. Schneider Institute for Health Policy, Heller School, Brandeis University, for the Asian Development Bank and Mongolian Ministry of Health. Waltham, MA: 2005. Orgil, B., Tsolmongerel, Ts. , Jargalsaikhan, N., Surenchimeg, V., Nyamkhorol, D. , Nandakumar, A.K.. Costing the Mongolian Essential Health Package. Asian Development Bank and Mongolian Ministry of Health.. Ulaanbaatar: 2005. Nandakumar, A.K., Bhawalkar, M., Tien, M., Ramos, R., Susna, D.. Synthesis of Findings from NHA Studies in Twenty Six Countries. Abt Associates, Funded by USAID. Cambridge, MA: 2004. Nandakumar, A.K., Wilweding, J.. Forecasting Expenditures on Health Care in Developing Countries: An Econometric Approach. Prepared for the International Association of Actuaries Health Section, Annual Conference, Dresden, Germany: 2004. Nandakumar, A.K.. National Health Accounts: Concepts and Policy Applications. Senior Policy Seminar on Health Systems Development for the Minister and senior bureaucrats from Ministry of Health in Iraq. Organized by the World Bank, World Health Organization, and Coalition Provisional Authority in Jordan: 2004. Azzam, O, Nandakumar, A.K., Ministry of Health,. Discussion Paper on Health Financing Policy for Samoa: Ministry of Health Preferred Option.. Confidential paper prepared by the Ministry of Health, Samoa. Funded by the World Bank and prepared for the Ministry of Health, Samoa.. Samoa: 2003. Bhawalkar, M., Susna, D., Maier, M., Martinez, R., Nandakumar, A.K., Tien, M.. Understanding NHA: The Methodology and Implementation Process Primer for Policy Makers. Abt Associates, Funded by the USAID. Bethesda, MD: 2003. Nandakumar, A.K., Azzam, O , NHA Team,. The Samoa National Health Accounts for FY 2000/01. Ministry of Health and World Bank. Funded by the World Bank and prepared for the Ministry of Health, Samoa.. Apia: 2003. Nandakumar, A.K., Bhawalkar, M., Tien, M.. Synthesis of National Health Accounts Findings from Twenty Six Countries. Presented at the Third International National Health Accounts Symposium, San Francisco, CA. : 2003. Nandakumar, A.K., Poullier, J.P.. National Health Accounts: Dealing with Specific Data Problems. Presented at the Regional National Health Accounts Conference, Cairo, Egypt. : 2003. Nandakumar, A.K., Susna, D.. National Health Accounts. A Brown Bag Presentation at USAID: 2003. Nandakumar, A.K., Wilwerding, J.. Using the National Health Accounts Framework to Estimate Expenditures on the Elderly in Jordan: 2000-2015. Presented at the Third International National Health Accounts Symposium, San Francisco, CA. : 2003. Nandakumar, A.K.. Conducting Regional Health Accounts: Methods and Problems. Presented at the Regional National Health Accounts Conference, Cairo, Egypt. : 2003. Nandakumar, A.K.. National Health Accounts Data Collection: Sources, Elements and Making a Data Plan. Presented at the Regional National Health Accounts Conference, Cairo, Egypt. : 2003. Nandakumar, A.K.. Policy Impact of NHA around the World. Presented at the Regional National Health Accounts Conference, Cairo, Egypt. : 2003. Susna, D., Dmytraczenko, T., Chanfreau,C., Kombe, G., Fairbank, A., Nandakumar, A.K.. Application of the National Health Accounts HIV/AIDS Subanalysis to the Resource Flow Project. Abt Associates. Cambridge, MA: 2003. Susna, D., Dmytraczenko, T., Chanfreau,C., Kombe, G., Fairbank, A., Nandakumar, A.K.. Note on Measuring Population Expenditures at a Subnational Level Using a National Health Accounts Framework. Abt Associates, Funded by the Netherlands Interdisciplinary Demographic Institute. Cambridge, MA: 2003. Nandakumar, , Ammar, W. , Mahal, A.. Estimating Baseline Health Expenditures on the Elderly in Lebanon. Presented at the NIA Research Grant Experts Meeting in China: 2002. Nandakumar, A.K., Bhawalkar, M.. An NHA Approach to Assess Expenditures on HIV/AIDS: The Methodology Applied to Rwanda. Presented at the NHA/HIV Workshop, Livingston, Zambia: 2002. Nandakumar, A.K., Wilwerding, J., Bhawalkar, M.. Jordan Healthcare Utilization and Expenditure Survey. Abt Associates, Primary Health Care Initiative Project, prepared for the Ministry of Health, Jordan, Bethesda, MD, Funded by the United States Agency for International Development. Cambridge, MA: 2002. Nandakumar, A.K.. National Health Accounts: Definition, Development and Use. Presented at Johns Hopkins University, Baltimore, MD: 2002. Nandakumar,, Brosk, H.. Expenditures on the Elderly: Baseline Estimates for Jordan. Presented at the Aging Populations: Health Systems and Policy Reform, 2nd Technical Meeting, Honolulu, HI: 2002. Azzam, O, Nandakumar, A.K., NHA Team,. Samoa National Health Accounts. Department of Health, Government of Samoa.. Apia: 2001. Barnett, C., Bhawalkar, M., Nandakumar, A.K., Schneider, P.. The Application of the National Health Accounts Framework to HIV/AIDS in Rwanda. Partnerships for Health Reform Project, Special Initiatives Report No. 31. Bethesda, MD: 2001. Bloom, D.E., Canning, D., Nandakumar, A.K., Sevilla, J., Huzarski, K., Levy, D., Bhawalkar, M.. Demographic Transition and Economic Opportunity: The Case of Jordan. PHRplus Project. Bethesda, MD: 2001. Mawajdeh, S., Khouri, S., Qtaishet, M., Khoury, R., Nandakumar, A.K., Bhawalkar, M., Arbaji, A.. Rationing Staffing Patterns and Cost Analysis of Primary Care Services in Jordan. Abt Associates. Primary Health Care Initiative Project, Bethesda, MD: 2001. Nandakumar, A.K., Bhawalkar, M., El-Adadwy, M.. Profile of Elderly with ADL Limitations in Egypt: Findings and Policy Implications. Presented at the American Public Health Association Conference, Atlanta, GA: 2001. Nandakumar, A.K., Schneider, P., Bhawalkar, M., Butera, D.. Estimating HIV/AIDS Expenditures in Rwanda Using an NHA Framework. Presented at the UNAIDS Conference, Curnevaca, Mexico. : 2001. Nandakumar, A.K.. Contribution of NHA to Policy Development in Developing Countries. Presented at The National Health Accounts Symposium, York, UK: 2001. Nandakumar, A.K.. Contribution of NHA to Policy Development in Developing Countries. Presented at the Senior Executives Workshop, Mombasa. : 2001. Nandakumar, A.K.. Contribution of NHA to Policy Development in Developing Countries. Presented at the World Bank Regional Conference, Poland: 2001. Nandakumar, A.K.. Long-Term Care: Definitions, Expenditures and Policy Issues. Presented at the World Bank Regional Conference, Poland: 2001. Nandakumar, A.K.. National Health Accounts: A Conceptual Overview. Presented at the Gulf Regional NHA Conference, Bahrain: 2001. Nandakumar, A.K.. National Health Accounts: Structure. Presented at the Gulf Regional NHA Workshop, Bahrain: 2001. Al-Gohly, F., Abdul-Mughni, A.T. , Nasser, N., Hashid, A.W.A. , Ali, A.W. , Maeda, A., Nandakumar, A.K.. Yemen National Health Accounts. World Bank.. Sana'a, Yemen: 2000. Ammar, W., Fakha, H., Azzam, O., Khoury, R.F., Mattar, C., Halabi, M., Aoudat, D., Srour, K., Nandakumar, A.K., Mechbal, A.H.. Lebanon National Health Accounts. World Health Organization.. Lebanon: 2000. Maier, M., Susna, D., Nandakumar, A.K., Bura, M., Cripps, G.. NHA: Regional Policy Brief: Eastern, Central and Southern Africa: Using NHA to Inform the Policy Process. Partnership for Health Reform Project, Abt Associates, Inc.. Bethesda, MD: 2000. Nandakumar, A.K., Banks, D., Bhawalkar, M., Shehata, M., Brosk, M., El-Samen, T.A., Saif, J.A., Fardous, T., Ideh, M., Al-Shatwieen, L., Qtaishet, M., Irshad, H., Ziadat, Z., Al-Madani, A.. Jordan National Health Accounts. Technical Report 49, Partnerships for Health Reform, Abt Associates. Bethesda, MD: 2000. Nandakumar, A.K., Chawla, M., Khan, M.. "Demand for Outpatient Health Care in Egypt: Perception and Reality." World Development 28. 1 (2000): 187-196. Nandakumar, A.K., Reich, M., Chawla, M., Berman P., Yip, W.. "Health Reform for Children: The Egyptian Experience with School Health Insurance." Health Policy 50. 3 (2000): 155-170. Nandakumar, A.K., Schneider, P., Bhawalkar, M., Butera, D.. Use of and Expenditure on Health Services by a Group of HIV+ Individuals in Rwanda. Abt Associates, prepared for the Ministry of Health, Rwanda, Funded by the United States Agency for International Development. Cambridge, MA: 2000. Nandakumar, A.K., Schneider, P., Damascene, B.. Use of and Expenditures on Outpatient Health Care by a Group of HIV Positive Individuals in Rwanda. Special Initiatives Report No. 28, Partnerships for Health Reform Project. Bethesda, MA: 2000. Nandakumar, A.K.. From Evidence to Reform: The Case of Egypt. Appraising a Decade of Health Sector Reform in Developing Countries: A DDM Symposium, Washington, DC. : 2000. Nandakumar, A.K.. Health Systems Improvement: Is there Convergence in Thinking?. Presented at the USAID State of the Art Conference, Turkey. : 2000. Nandakumar, A.K.. International Demography of Aging: Facts and Implications. Presented at the Harvard-Tekiyo Seminar on Aging and Health: Environment, Work, and Behavior, American Academy of Arts and Sciences, Cambridge, MA: 2000. Nandakumar, A.K.. National Health Accounts: Application, Impact, and Methods. Presented at the Ministry of Health, Western Samoa: 2000. Nandakumar, A.K.. National Health Accounts: Method, Impact and Application to Estimating Program Expenditures. Presented to USAID, Washington, DC: 2000. Nandakumar, A.K.. Resource Transfer Mechanisms for HIV/AIDS. Presented at the UNAIDS Conference, Malawi: 2000. Nandakumar, A.K.. Using National Health Accounts to Measure the Impact of Decentralization. Presented at the First National Health Accounts Workshop, Kigali, Rwanda: 2000. Schneider, P., Nandakumar, A.K., Porignon, D., Bhawalkar, M., Butera, D., Barnett C.. Rwanda National Health Accounts. Special Initiatives Report No. 53, Partnerships for Health Reform Project. Bethesda, MD: 2000. Berman, P., Nandakumar, A.K., Yip, W.C.. Health Care Utilization and Expenditures in the Arab Republic of Egypt 1994-95: Report from the DDM Survey. Partnerships for Health Reform Project. Bethesda, MD: 1999. Chawla, M., Nandakumar, A.K., Berman, P.. Multiple Job Holdings: Why, Impact, and Implications for Public Policy. Department of Population and International Health, Harvard School of Public Health. Boston, MA: 1999. Nandakumar, A.K., Abdul-Latif, M., El-Beih, W.. Options for Financing Health services in the Pilot Facilities in Alexandria. Technical Report 36, Partnerships for Health Reform Project, Bethesda, MD. Bethesda, MD: 1999. Nandakumar, A.K., Berman, P., Fleming, E.. Findings from the Egyptian Health Care Provider Survey. Technical Report 26, Partnerships for Health Reform Project. Bethesda, MD: 1999. Nandakumar, A.K., Nada, K., Ibrahim, A, Ezzat, M., El-Beih, W.. Health Expenditure Review: Alexandria, Egypt. Technical Report 35, Partnerships for Health Reform Project. Bethesda, MD: 1999. Nandakumar, A.K.. Aging Populations in Developing Countries: How to Pay for their Health Care Costs?". Presented at the Managing Health Programs in Developing Countries, Harvard School of Public Health, Boston, MA: 1999. Nandakumar, A.K.. Health Care Financing. Presented at the University of Butare, Rwanda: 1999. Nandakumar, A.K.. Health Expenditures in Yemen: Policy Implications. Presented at the First National Health Accounts Symposium, Sana'a: 1999. Nandakumar, A.K.. Hospital Costs and Their Impact of Health Sector Reform Design. Presented at the WHO Hospital Cost Analysis Workshop, Egypt: 1999. Nandakumar, A.K.. National Health Accounts: Concept and Methodology. Presented at the First Regional National Health Accounts Workshop, Tunisia: 1999. Nandakumar, A.K.. Paying the Health Care Costs of the Elderly: The US Experience and Implications for Developing Countries. Presented at the Workshop for Health Care Professionals from Argentina, Harvard Institute for International Development, Cambridge MA: 1999. Nandakumar, A.K.. School Health Insurance: The Experience in Egypt. Presented at the APHA, Washington, DC: 1999. Nandakumar, A.K.. Financing Reform in Lebanon: Can National Health Accounts Help?. Case study prepared for World Bank Flagship Course. Beirut, Lebanon: 1999. Frere, J.J., Nandakumar, A.K.. Costing the Basic Benefits Package in Egypt. Technical Report 32, Partnerships for Health Reform Project. Bethesda, MD: 1998. Garg, C.G., Nandakumar, A.K., Berman, P.. Equity in Financing and Utilization of Health Care in India. Data for Decision Making Project, Department of Population and International Health, Harvard School of Public Health. Boston, MA: 1998. Nandakumar, A.K., El-Adawy, M., Cohen, M.. Perception of Health Status and Limitations in Activities of Daily Living among the Egyptian Elderly. Data for Decision Making Project, Department of Population and International Health, Harvard School of Public Health. Boston, MA: 1998. Nandakumar, A.K.. Health Care Reform in Developing Countries. Presented at the Harvard International Development Conference, Cambridge, MA. : 1998. Nandakumar, A.K.. National Health Accounts: Methods and Applications. Presented at the First National Health Accounts Workshop, Partnerships for Health Reform, Jordan: 1998. Nandakumar, A.K.. Egypt's Health Sector Reform: Its Characteristics, Problems, and the Path to Reform. Department of Population and International Health, Harvard School of Public Health. Boston, MA: 1998. Rannan-Eliya, R.P., Blanco-Vidal, C., Nandakumar, A.K.. The Distribution of Health Care Resources in Egypt: Implications for Equity: An Analysis Using a National Health Accounts Framework. Data for Decision Making Project, Department of Population and International Health, Harvard School of Public Health. Boston, MA: 1998. Berman, P., El-Adadwy, M., Nandakumar, A.K., et al,. A Reform Strategy for Primary Care in Egypt:. Technical Report 9, Partnerships for Health Reform Project. Bethesda, MD: 1997. Cohen, M., Nandakumar, N.. "The Changing Face of Long Term Care Insurance in 1994: Profiles and Innovations in a Dynamic Market." Inquiry-the Journal of Health Care Organization Provision and Financing 34. 1 (1997): 50-61. El Fattah, H.A., Saleh, I., Ezzat, E., El-Saharty, S., El-Adawy, M., Nandakumar, A.K., Connor, C., Salah, H.. The Health Insurance Organization of Egypt: An Analytical Review and Strategy for Reform. Partnership for Health Reform Project. Bethesda, MD: 1997. El Masri, B. , Gabra, N. , Afefi, I., Ahmed, M. , Edries, H., Nageb, G. , Hassan, R. , Ibrahim, A , (Suez Team), S. , Fouad, S. , Ezat, E., Yousri, M. , Sharawy, M. , Fathy, H. , Moustafa, I. , Madkour, F. , Ismail, A., El Latif, A. Ab, Soliman, H. , F. Cost Analysis and Efficiency Indicators for Health Care: Suez General Hospital. Boston, MA Data for Decision Making Project, Harvard School of Public Health: 1997. Mohammed, F., Ali, M., Abd El Gel, K. , Safwat, H., Ismail, S., Nabel, A.G., Sadek, H.A. , (Alexandria Team), , Omar, A., Helmy, S., Serry, M., El Serag, I.El, Sadek, A.R. , Eid, M., (Bani Seuf Team), , El Masri, B., Gabra, N., Afefi, I., Ahmed, M. , E. Summary Output for 19 Primary Health Care Facilities in Alexandria, Bani Seuf and Suez 1993-94. Data for Decision Making Project, Harvard School of Public Health.. Boston, MA: 1997. Mohammed, F., Ali, M., Abd El Gel, K. , Safwat, H., Ismail, S., Nabel, A.G., Sadek, H.A. , (Alexandria Team), , S. Fouad, E. , Ezat, M. , Yousri, M. , Sharawy, H. , Fathy, I. , Moustafa, I. , Madkour, F., Ismail, A., Ab El Latif, A., Soliman, H., Farg,. Cost Analysis and Efficiency Indicators for Health Care: El Ganhuria General Hospital. Data for Decision Making Project, Harvard School of Public Health.. Boston, MA: 1997. Nandakumar, A.K.. National Health Accounts: A Tool for Planning and Monitoring Health Care Financing Reform. Presented at The Regional Seminar on Health Sector Development in the Middle East and North Africa, organized by the Economic Development Institute of the World Bank, Cairo, Egypt: 1997. Omar, A. , Helmy, S. , Serry, M. , Serag, I.El , Sadek, A.R. , Eid, M. , (Bani Seuf Team ), , Fouad, S., Ezat, E., Yousri, M., Sharawy, H. , Fathy, H., Moustafa, I. , Madkour, F. , Ismail, A., Ab El Latif, A. , Soliman, H. , Farg, M. , (Department of. Cost Analysis and Efficiency Indicators for Health Care: Beni-Suef General Hospital. Data for Decision Making Project, Harvard School of Public Health.. Boston, MA: 1997. Sharon, B., Nandakumar, A.K., Qassim, T.A.. The Yemeni Health Care Consumer. World Bank.. Sana'a, Yemen: 1997. Nandakumar, A.K.. Egypt's National Health Accounts and Relevance to Policy Formulation. Presented at the Shams International Conference on Health Care, Egypt: 1996. Nandakumar, A.K.. The Role of Governments in Health Sector Reform. Presented at the Ministry of Health, Gaza: 1996. Nandakumar, A.K.. Health Care Financing Issues. Egypt's Health Policy in Transition: Towards a Dialogue on Policy Formulation, Cairo, Egypt: 1995. Nandakumar, A.K.. Household Utilization of Health Care and Implication for Community Monitoring. Presented at the Household Monitoring for Health Conference, Suez Canal University, Ismalia, Egypt: 1995. Nandakumar, A.K.. Re-envisioning the Role of the Government in Health Care. Egypt's Health Policy in Transition: Towards a Dialogue on Policy Formulation, Cairo, Egypt: 1995. Nandakumar, A.K.. School Health Insurance: The Experience in Egypt. Presented at the UNDP-Indian Institute of Management Health Insurance in India: Issues and Prospects Conference, Bangalore, India: 1995. Nandakumar, N., Cohen, M., Bishop, C.E., Wallack, S.S.. "Understanding the Factors Behind the Decision to Purchase Varying Coverage Amounts of Long-Term Care Insurance." Health Services Research 29. 6 (1995): 653-678. Cohen, M., Kumar, N., Wallack, S.S.. "Long Term Care Insurance and Medicaid." Health Affairs 13. 4 (1994): 127-139. Ingoldsby, A., Kumar, N., Cohen, M., Wallack, S.S.. "Medicare Home Health Care: The Struggle for Definition." Pride Institute Journal 13. 3 (1994): 16-31. Nandakumar, A.K.. Definition and Computation of Economic Costs. Presented at the First Workshop Using Cost Effectiveness Analysis to Identify a Package of Priority Health Interventions, Ismalia, Egypt: 1994. Bishop, C.E., Kumar, N., Cohen, M.. Medicare Covered Home Health Services: The Struggle for Definition and Implications for Populations Served. Report Submitted to Robert Wood Johnson Foundation. 1993. Bishop, C.E., Kumar, N., Cohen, M.. The Impact of State Medicaid Characteristics on the Purchase of Long-Term Care Insurance. Report Submitted to the Health Care Financing Administration. 1993. Brandeis University and LifePlans, Inc.. Medicare Covered Home Health Services: The Struggle for Definition and Implications for Populations Served. Report submitted to the Robert Wood Johnson Foundation. 1993. Cohen, M., Nandakumar, A.K., Wallack, S.S.. "Simulating the Fiscal and Distributional Impacts of Medicaid Eligibility Reforms." The Health Care Financing Administration Review 14. 4 (1993): 133-150. Cohen, M., Nandakumar, N., Wallack, S.S.. "New Perspectives on the Affordability of Long-Term Care Insurance and Potential Market SIze." The Gerontologist 33. 1 (1993): 105-13. Nandakumar, A.K., Bishop, C.E.. Effect of Medicaid on the Demand of LTC Insurance. Presented at the National Bureau for Economic Research, Summer Conference, Cambridge, MA: 1993. Cohen, M., Nandakumar, A.K., Wallack, S.S.. "Financing Long-Term Care: A Practical Mix of Public and Private." The Journal of Health Politics, Policy and Law 17. 3 (1992): 403-423. Cohen, M., Nandakumar, A.K., Wallack, S.S.. "Who Buys Long-Term Care Insurance: A Study of Purchasers and Non-Purchasers of Long-Term Care Insurance." Health Affairs Spring 11. 1 (1992): 208-223. Nandakumar, A.K.. A Model for Long-Term Care Insurance. Presented at the Harvard/Boston University/Massachusetts Institute of Technology Health Economics Seminar, Boston, MA: 1992. Nandakumar, A.K.. The Impact of Caregiving on the Demand for Long-Term Care Insurance. Presented at The Changing Face of Informal Caregiving, A National Conference on Policy Directions for the 1990s, Berkeley Springs, WV: 1992. Nandakumar, A.K.. An In-Depth Study-Who's Buying Long-Term Care Insurance, Who Isn't, and Why?. Presented at the Seminar on Long-Term Care-Marketing, Pricing and Underwriting in an Evolving Market, Executive Enterprises, Inc., Washington, DC: 1991. Nandakumar, A.K.. New Perspectives on the Affordability of Long-Term Care Insurance. Presented at the 7th Annual Private Long-Term Care Insurance Conference, Baltimore, MD: 1991. Nandakumar, A.K.. The Demand for Long-Term Care Insurance. Presented at the Health Insurance Association of America, Washington, DC: 1991. Nandakumar, A.K.. Understanding the Long-Term Care Insurance Market: Making the Pieces Fit, Who Buys LTC Insurance. Seminar for the American Association of Homes for the Aging, Orlando, FL, and Dallas, TX: 1991. Nandakumar, A.K.. Who Buys Long-Term Care Insurance and Why. Presented at the 7th Annual Private Long-Term Care Insurance Conference, Baltimore, MD: 1991. Wallack, S.S., Cohen, M., Kumar, N., McGuire, T.. Long-Term Care Financing Proposals: Their Costs, Benefits and Impact on Private Insurance. Research Bulletin, LifePlans/HIAA publication. 1991. Wallack, S.S., Cohen, M., Kumar, N., Rodwin, M.. Consumer Protection and Long-Term Care Insurance: A Framework for Analysis and Policy Options. LifePlans, Inc.. Waltham, MA: 1991. Wallack, S.S., Cohen, M., Nandakumar, A.K., McGuire, T.. Long-Term Care Financing Proposals: Their Costs, Benefits and Impact on Private Insurance. LifePlans/Health Insurance Association of American (HIAA) Research Bulletin. Waltham, MA: 1991. Wallack, S.S., Cohen, M., Nandakumar, A.K., Rodwin, M.. Consumer Protection and Long-Term Care Insurance: A Framework for Analysis and Policy Options. Executive Summary, LifePlans Publication. Waltham, MA: 1991. Cohen, M., Kumar, N., McGuire, T., Wallack, S.S.. Financing Long-Term Care: The Impact of Alternative Government Programs and the Potential of Private Insurance. HIAA. 1990.